Pres. 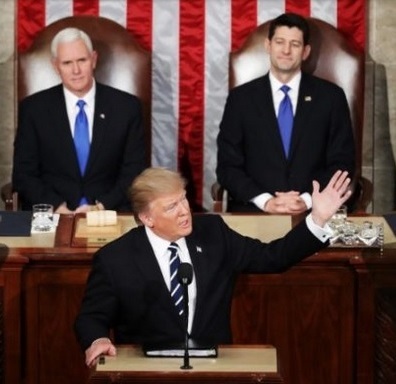 Trump's first address to a joint session of Congress was popularly called the "State of the Union" address, although that formal speech is not constitutionally required of an incoming president. Donald Trump: Restart engine after worst financial recovery in 65 years. Steve Beshear: Balance budget and create opportunity for every American. Steve Beshear: Be people's champion, not Wall Street's champion. Donald Trump: Unify behind law enforcement; support the victims of crime. Donald Trump: Stop drugs pouring into country & poisoning our youth. Donald Trump: School choice is civil rights issue of our time. Donald Trump: Stop threatening the livelihood of our coal miners. Donald Trump: Bipartisan effort to implement paid family leave. Donald Trump: America is once again ready to lead. Donald Trump: Unbreakable alliance with the state of Israel. Steve Beshear: Moral obligation to help those fleeing war and terror. Donald Trump: US companies pay high tariffs abroad; let's change that. Donald Trump: End TPP; make American pipelines with American steel. Donald Trump: Lifetime ban on becoming foreign lobbyists. Donald Trump: For every new regulation, must eliminate two old ones. Steve Beshear: I cut my own pay and we balanced our budget. Donald Trump: Lower the cost of health insurance, instead of mandates. Donald Trump: Expand Health Savings Accounts but not forced by government. Donald Trump: Slash restraints at FDA; get blessed with more miracle drugs. Steve Beshear: ObamaCare is life and death for people, but needs repairs. Donald Trump: Cannot allow beachhead of radical Islamic terrorism. Donald Trump: Meaningful engagement with allies paying their fair share. Donald Trump: Negotiate prices for the fantastic new F-35 jet fighter. Donald Trump: More tools so our military can fight and win. Donald Trump: Restore integrity at borders instead of lawless chaos. Donald Trump: Merit-based immigration system instead of lower skills. Donald Trump: New agency VOICE: Victims of Immigrant Crime Engagement. Donald Trump: Two core principles: buy American, and hire American. Donald Trump: Put American citizens first, to make America great again. Donald Trump: Trillions abroad while crumbling infrastructure at home. Donald Trump: New program of national rebuilding, like Ike's interstates. Donald Trump: ISIS are lawless savages; extinguish them from our planet. Steve Beshear: Russia is not our friend; don't ignore serious threats. The above quotations are from 2017 State of the Union address to Congress, plus the Democratic response, Feb. 28, 2017.